But that otherwise draws to a conclusion our live text commentary of today's Premiership action. Coverage of South Africa v New Zealand in the World Cup semi-finals is already under way right here. But otherwise, it's goodbye for now! You'll be able to follow live radio coverage from Sandy Park at 18:00 BST on this very page - so please do pop back later! Wasps edged out last season's Premiership finalists Bath at the Ricoh Arena to record their first victory of the season. The hosts led 6-3 after a rain-affected first half, with Jimmy Gopperth and George Ford trading penalties. A penalty try and three more points from the boot of Gopperth extended their advantage to 13 points with 20 minutes remaining. Ford added two further penalties but Bath could not force an equalising try. Wasps get a penalty from the scrum and that's the game. Jimmy Gopperth boots the ball into touch and they register their first win of the season. The scrum is re-set twice and we enter the final minute. Frustrating for Bath and their supporters. Bath pick and go several times but are unable to find space as the Wasps defence holds strong. They look to go down the blindside and are pushed back, and then referee Craig Maxwell-Keys blows up for a forward pass. Wasps are penalised for not rolling away after the tackle, and this time Ford goes for the corner. They have a line-out about eight metres out from the Wasps line. Can they force a score? Ford's kick is successful and Bath are back to within a converted score of Wasps. The clock is against Bath - just over five minutes remain. Wasps are penalised for coming in at the side and Bath get another penalty in the 22. Ford wants the three points again and signals to the posts. The two sides are trading kicks again, and Wasps get a turnover in the Bath 22. They have numbers out wide but the ball is knocked on close to the line and the chance is gone. Wasps are penalised at the resulting scrum and Bath can look for territory. Just over 10 minutes are left at the Ricoh Arena. George Ford's attempt is successful and Bath are now 10 points behind the Wasps. But will the visitors regret an opportunity to go for the corner and force a try? Bath get a penalty at the scrum and decide to go for the posts rather than kick for the corner. Visiting scrum-half Niko Matawalu returns to the field and they are back up to 15 men. The Fijian's yellow card has been the turning point in this game so far. Can the Blue, Black and Whites find a way back into the match? 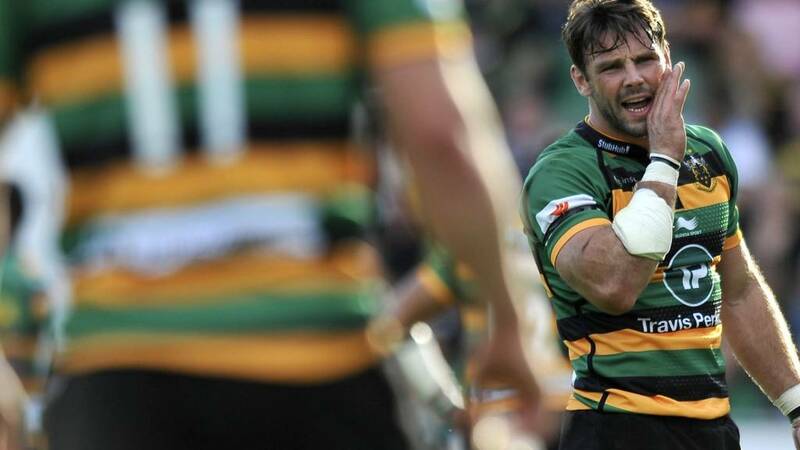 There goes the final whistle - and Northampton Saints have secured their first Premiership win of the season with a bonus-point victory over Newcastle Falcons. Bath concede another penalty, this time at the scrum. Former Newcastle and Leinster man Jimmy Gopperth slots the ball through the posts with ease. Bath are forced into a reshuffle after Matawalu's yellow card. George Ford moves to scrum-half in the Fijian's absence, with Rhys Priestland switching to fly-half. Just over 20 minutes remain and Bath will have to keep it tight while they are down to 14 men. We're into the final five minutes now. Northampton have another penalty too, right in front of the posts - but Stephen Myler heads for touch instead. After sustained Wasps pressure on the Bath line, the visitors turnover the ball. But Niko Matawalu's clearing kick is charged down by Nathan Hughes and then the Fijian clips the onrushing attacker. After deliberation with the TMO, referee Craig Maxwell-Keys sends the Fijian to the sin-bin and awards a penalty try. Jimmy Gopperth converts for a 13-3 lead. We've gone try crazy at Stadium MK - and Ben Foden has himself a brace for Northampton Saints. Stephen Myler pops the extras over and any remaining Newcastle hope diminishes almost instantly. Wasps have defended well this afternoon, and clear the danger with a turnover. A long kick downfield sets up a footrace between Christian Wade and George Ford. The Bath man comes out on top but his clearing kick hands Wasps an attacking opportunity. There's half an hour remaining at the Ricoh. It's a very tight game. But did I speak too soon?! Tom Penny, only just on from the bench, has crossed the whitewash to score Newcastle's first try of the afternoon. Tom Catterick converts and maybe, just maybe, the Falcons have a glimmer of hope. And full-back Ben Foden has indeed secured the bonus point after some consultation with the TMO. This has been a brutal wee period from Saints. Stephen Myler converts and this is fast becoming a case of not if or when but how many. Joe Simpson puts a long box kick down the field but again it goes out on the full. Bath have a line-out just outside the Wasps 22. Wales international Rhys Priestland has come off the bench to make his debut for the visitors, replacing Kyle Eastmond. Gopperth gets another chance to go for the posts moments later, from a more central position, as the visitors are penalised at the ruck. However the fly-half is off target again, watching his kick drifts wide. Bath are let off the hook again. Bath centre Kyle Eastmond knocks on and Tom Homer jumps on the ball from an offside position, giving Wasps a penalty. It's fairly far out, five metres into the Bath half and out wide, and Jimmy Gopperth does not have the distance as his effort falls short. Cripes, Northampton are really turning the screw in Milton Keynes and that could well be game, set and match Saints. Luther Burrell does the damage this time, grabbing the hosts' third try of the afternoon. One more needed for the bonus point. And Christian Day makes it count, as another rolling maul sees the lock grab his second try of the afternoon. Stephen Myler converts and this has been a great deal more ruthless from Northampton in the second half. We're back under way at the Ricoh Arena, as Wasps fly-half Jimmy Gopperth gets the action underway in the second half. No changes to either XV at the break. It's started to rain again. Todd Clever has now been sent to the bin for a latest Falcons infringement. Northampton continue to pile forward, uninterested in any kicks for goal... But Ben Foden has dropped it and the visitors survive for now. The away side are weathering an almighty storm here, as Saints force their way up to the five-metre line before Newcastle give away another penalty. One-way traffic at the moment. The opening exchanges of the second half really have been a carbon copy of the first, as again Newcastle infringe at the breakdown. Stephen Myler pops the ball into touch. Just as they did in the first half, Northampton begin the second period with a penalty, kick to touch and rolling maul. This time, however, the Falcons defence deal with it and Ruki Tipuna is able to get rid. Joe Simpson sends a kick out on the full, giving Bath a line-out just inside the Wasps 22. The visitors form a maul but are then penalised by referee Craig Maxwell-Keys, who calls time on the first half. Conditions have not allowed for much running rugby to be played and it has been fairly attritional at the Ricoh. We're back under way at Stadium MK then. Both of these teams lost their openers last week - which one can get off the mark today? George Ford tries an ambitious drop-goal from almost the half-way line which goes just wide. Wasps have a narrow lead to protect in the last few minutes of the half. Wasps go through the phases in the Bath 22, without threatening the try-line and eventually win a kickable penalty, just to the left of the upright. It is meat and drink for Jimmy Gopperth, who slots it home to put Wasps back in the lead. Just over five minutes to half-time, and the rain has stopped at the Ricoh. Ford converts the kick from the 22-metre line, 15 meters in from the left-hand touchline, and the flags go up. Bath are level, with just over 10 minutes until the break. George Ford kicks Bath downfield from a penalty, offering an attacking platform just inside the Wasps 22. Ross Batty throws long and Wasps are penalised for not releasing in the tackle, offering Ford a relatively simple kick to tie the scores. Northampton were unable to build upon their ferocious opening quarter, but their lead is a comfortable one at the interval. But how often do you see this? Immediately from the restart Newcastle concede a penalty, which Stephen Myler pops over the posts. The seven-point advantage is restored 60 seconds before the break. After 13 minutes, when Saints led 13-0, it wasn't looking brilliant for Newcastle - but they've done a fine job since then. Northampton infringe at the breakdown and Mike Delany takes another chunk out of the score, splitting the posts from 35 metres out. Wasps are on the attack in the Bath 22, and the visitors concede a penalty for offside just to the right hand side of the posts. Jimmy Gopperth makes a good connection and bisects the posts to open the scoring midway through the first half. Poor old George Pisi, the Samoan has taken a knock and the commentators on BBC Newcastle suggest "he doesn't know what day of the week it is". Unsurprisingly, he makes way for JJ Hanrahan. Both sides are favouring the kicking game as they search for territory, with conditions making handling and running rugby tricky. Patience and discipline could be key this afternoon. Quarter of an hour gone at the Ricoh Arena, and we are still scoreless although Wasps have threatened the Bath line on a couple of occasions, only to be called back for penalties. This has been a decent recovery from the away side, who of course lost to Gloucester in their opening match seven days ago. Kiwi kicker Mike Delany has reduced their deficit to seven points at Stadium MK, with just over 10 minutes to go until half-time. Wasps attack down the left and Christian Wade sends a grubber kick through, but Niko Matawalu sprints back to knock the ball away. However, the Fijian scrum-half slips off the pitch and crashes into the advertising hoardings, injuring his knee. He is fit to continue after having both knees strapped up. A few handling errors are creeping in now, with first a knock-on from Falcons and then a spill from Saints ensuring that possession is swapped this way and that. Still 10 points separate the two teams. Wasps are penalised for an infringement at the scrum, and Tom Homer goes for the posts from the 10-metre line, far out on the left. His kick has the distance, but not the accuracy, as it drifts wide. Ford's boot puts Wasps under pressure early on but Anthony Watson struggles to claim a high kick and hands the home side a scrum for a knock-on. Newcastle are on the board at last now though, as Saints are caught offside and All Black one-cap wonder Mike Delany lands the kick. And we're under way in the second game of the day at the Ricoh Arena. Bath's George Ford gets us under way, with the visitors are in their change strip of all white. The teams are out at the Ricoh Arena for today's second Premiership game. More Newcastle indiscipline - and three more points for Stephen Myler right in front of the posts. Saints continue to boss it. It's been all Northampton in the opening 10 minutes in Milton Keynes, with Newcastle conceding yet another penalty, this time for crossing. No more fun in the corner for Stephen Myler, however - the England fly-half opts to split the posts to make it 10-0. And the pressure tells, with Christian Day grabbing the first try of the afternoon for Northampton behind a rolling maul following the latest line-out. An ominous old start for Newcastle, is this. Stephen Myler converts, Saints lead by seven. The home side are on top in the opening stages - Falcons have conceded three penalties inside the opening three minutes already. But each time Northampton turn down the three-point opportunity, instead heading for the corner. Saints fly-half Stephen Myler gets us up and running, Northampton in their familiar green, yellow and black this afternoon. Right then, kick-off is just a few moments away at Northampton's home from home at Stadium MK. More than 20,000 tickets have been sold for this match - not too shabby. The two teams are out. Newcastle Falcons' squad shows six changes, with returning Scotland World Cup prop Jon Welsh and Italy wing Giovanbattista Venditti both in the side. Samoa wing Alesana Tuilagi and Tonga flanker Nili Latu, Josh Furno and Ally Hogg are also in the starting XV. Northampton Saints make three changes from the side who lost at Worcester. George Pisi replaces the injured Tom Stephenson at centre, while Courtney Lawes and Tom Wood are back from World Cup duty with England. Bath make two changes to the side which edged Exeter 19-17 last weekend. Ollie Devoto comes in at outside centre, while Fijian scrum-half Niko Matawalu, signed from Glasgow Warriors, makes his first Premiership start. Replacements: Webber, Lahiff, Wilson, Day, Mercer, Cook, Priestland, Banahan. Wasps include England internationals James Haskell and Joe Launchbury for their first home game of the season. Winger Frank Halai makes his debut, while Lorenzo Cittadini, also back from Rugby World Cup duty with Italy, is named among the replacements. Replacements: Johnson, McIntyre, Cittadini, Myall, Jones, Robson, Jackson, Tagicakibau. We'll have live text commentary on the first two - at the Ricoh Arena and Stadium MK - and radio coverage of all three, with Exeter Chiefs v London Irish kicking off at 18:00 BST. To tune in to our selection of radio commentaries, pop up to the 'Live Coverage' tab at the top of this page. It's World Cup semi-final weekend! But before we all get stuck into a couple of spectacular south hemisphere tussles, we have a little something to whet the appetite. The English Premiership is already in full swing again - and there's three more matches to get our teeth stuck into today.